Mike Remembers: As the sister game of Capt. Fantastic, Wizard! also holds a prominent spot by its side at the Arcade. 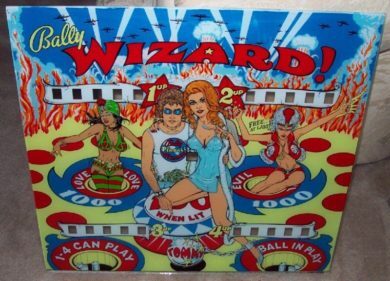 My earliest memory of this game was at the Wizard Arcade across from the Britannia Drive In Cinema on Carling Avenue. Another beautiful work of art by Dave Christensen, this game would still draw coins from my pocket even after the solid-state pinball machines had taken over, where at 2 games for 25 cents, it was a great value and still a fun game to play.